Fragrant yellow flowers (lutea means yellow) opening up to 10" wide. Deep green exotic looking leaves stretching almost 3' in diameter. What's not to like? Even the shower-head seed pods draw interest. Of course, there are those who don't share my enthusiasm for this native aquatic plant, but more about that later. I always gave American lotus special status in my past BYGL reports by declaring it's the only lotus species that's native to the U.S. and Canada. While that remains true, I must reconsider my lofty assertion since learning there are only two species of lotus in the world. The other is the sacred lotus, N. nucifera, which is also called the Indian, Asian, or pink lotus. Both lotus species once belonged to the water lily family, Nymphaeaceae, in the plant order Nymphaeales. However, based on DNA sequencing, they are now placed in their own family, Nelumbonaceae, and moved to a different order, Proteales. Genetic analysis also showed that their closest living relatives are members of the families Proteaceae and (I hope you're sitting down) Platanaceae; plane trees! The apparent similarities between lotus and water lilies is now considered the result of convergent evolution where natural selection produces comparable features among unrelated or distantly related organisms. A frequently used example are bats, birds, and insects all having wings. American lotus colonies spread by seeds and submerged rhizomes. The plants are not free-floating; they must be rooted into submerged soil. That's why plants grow around the edges of ponds or in the shallow waters of lake inlets or river backwaters; oxbows are a favored location. The lotus plants provide a healthy habitat for a wide range of micro and macro organisms. The large leaves protect immature fish from predators, the seeds are utilized by ducks and other migratory birds, and the rhizomes are eaten by beavers and muskrats. American lotus can be enjoyed in a number of locations around Ohio. A few intrepid participants in yesterday's OSU Extension, Hamilton County, Master Gardner Volunteers Diagnostic Walk-About at Glenwood Gardens (Great Parks of Hamilton County) made the trek in the early afternoon heat to view a beautiful lotus display in a pond located towards the back of the park. You can also find the American lotus growing in shallow inlets along Lake Erie as well as Tappan Lake in northeast Ohio and Cowan Lake located just southwest of Wilmington, OH. Indeed, the parks' website says, "Cowan Lake State Park offers a peaceful setting replete with scenic inlets laden with the American Lotus ..."
Not everyone views American lotus with the same appreciation. Although native, it can be aggressive in colonizing shallow waters creating a challenge to those who pursue other aquatic beauties such as bass, sunfish, etc. Don't confuse American lotus with its non-native cousin; the sacred lotus. 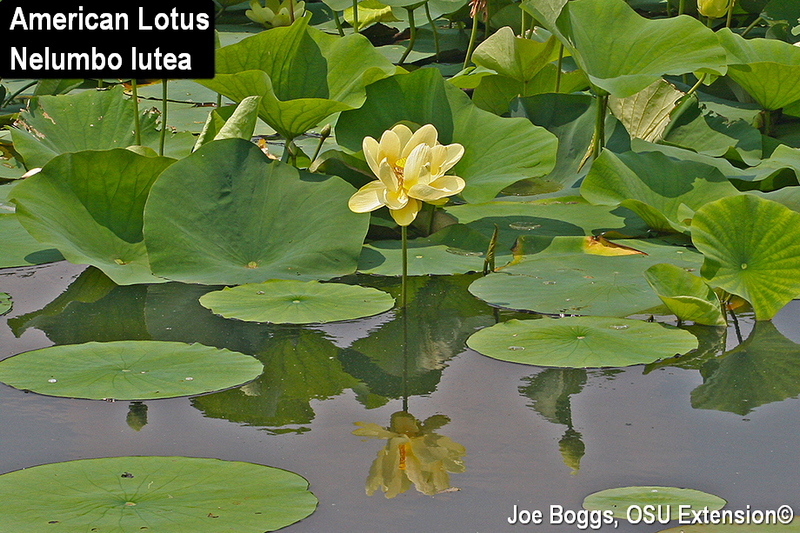 Unfortunately, this lotus has found its way into some Ohio waters which is why it is included in the recently published Ohio Field Guide to Aquatic Invasive Species [see "More Information" below]. The easiest way to tell the difference is the color of the flowers: sacred lotus has pink flowers, thus the other common name of pink lotus.